Taking a look at Alabama's schedule, it's difficult to find two games that you can mark as losses. With, in my opinion, the best backfield in the SEC, consisting of T.J. Yeldon, Derrick Henry, and Kenyon Drake, the Tide won't even need to rely on their biggest question mark coming into this season -- a quarterback. Under Nick Saban, Alabama doesn't "rebuild", they "reload". This year should be no different, as the Tide should roll on to an 11-win season with a loss coming to either LSU on the road, or against Auburn in Bryant-Denny. It's been tough to get a good read on the Razorbacks for the last few seasons. Ever since Petrino's premature departure from Fayetteville, Arkansas has struggled to maintain an identity. After finishing winless in the conference last season, HC Bret Bielema is desperately searching for answers to get his Hogs on the right track. Yet, with only 11 returning starters coming into the 2014 season (7 offense, 4 defense), this year might not be the year. Most of the responsibility on the offensive side of the ball must fall on QB Brandon Allen's shoulders. Last year the junior quarterback finished with a 49.6% completion percentage, which in the SEC just isn't gonna cut it. However, the one constant factor for this team comes in the backfield, as sophomore Alex Collins proved to be one of the most dynamic backs in the league last year as a freshman, and I'm interested to see the explosive tailback progress during his time at Arkansas. However, that doesn't cover up the fact that there are some serious glaring issues on both sides of the ball, especially with such an inexperienced defense entering fall camp, which in the SEC West, proves to be disastrous. Early matchups against Auburn and two solid non-conference teams (@Texas Tech, Northern Illinois) will be quite the test for the 2014 Razorbacks. Seconds away from a national championship last season, Gus Malzahn's Tigers have a mighty steep road ahead of them for the 2014 season. However, this is a near identical team as the 2013 Auburn Tigers. While the reigning SEC champions lose a key blocker in Jay Prosch, and a reliable tailback in Tre Mason, Auburn reloads both positions with Brandon Fulse doing some great work at the H-back position, while Corey Grant and Cameron Artis-Payne are splitting duties in the backfield. Auburn's rigorous schedule is the only factor that holds me back from calling a repeat, but nonetheless, there is no reason the Tigers shouldn't win at least 10 this year. To call Will Muschamp's third season in Gainesville a disappoint is being kind. Florida's downfall last year stemmed from multiple factors, but the main being injuries to an abundance of key players. While the Gators' defense last season remained one of the best (#8 in the nation), their offense was extremely lacking to say the least, as they finished the season ranked 114th nationally in total offense. But for 2014, with a starting offensive line consisting of juniors and seniors, it can only get better, right? Right?! I think so... even with Jeff Driskel back making the calls from the shotgun. Florida makes a bowl, BUT doesn't get the over. It's unreasonable to expect an 8-win season after last year's disaster, especially with such a brutal schedule. Similarly to Florida, Georgia was hit by a serious injury bug during the 2013 season, and they hope to keep the word "injury" out of the fall camp headlines as much as they can. Unfortunately for Mark Richt and the Dawgs, Georgia has already suffered two key injuries in WR Malcolm Mitchell, who if you'll remember suffered a season-ending injury in the season opener last season, and TE Jay Rome who is currently recovering from surgery in his right foot. Rome, unlike Mitchell, will likely be 100% for the season opener against Clemson, and is poised for a breakout season this year. With nine returning starters on defense, I fully expect Georgia to achieve a 10/11 win season behind the arm of Hutson Mason (mark my words, this kid will be a stud). As Mark Stoops realized last season, it's mighty tough to win at Kentucky. Winless in the SEC, as well as a loss to Western Kentucky to start his head coaching career, Stoops is looking for 2014 to be a sudden turn in the right direction -- he might just get that. With eight starters returning on defense, the former Florida State defensive coordinator is expecting a significant step forward this season. The air-raid mentality of OC Neal Brown disappointed in year one, but with two former 4-star recruits, Patrick Towles and Drew Barker, competing for the starting job this season, Brown is looking for the type of success he had instilling the same system at Texas Tech just a few years ago. Expect an improved Kentucky team that's headed in the right direction. One thing we know for sure with this LSU team is that they will be relying heavily on the power-run game. Zach Mettenberger? Gone. Odell Beckham/Jarvis Landry? Gone. So what's left? An absolute dominating offensive line to lead the way for 2014's #1 recruit, Leonard Fournette. On the other side of the ball, DC John Chavis is looking for a much improved Tiger defense, as LSU allowed 5.7 yards per play last year (7th in the SEC) -- a stat that won't win an SEC west title. 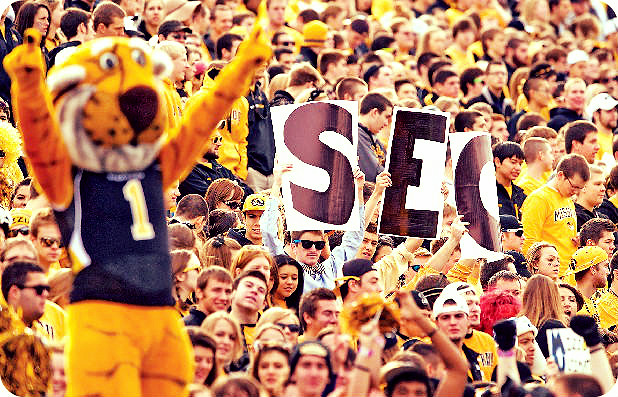 Are the Tigers good enough to be considered for an SEC west title this year? Absolutely not. This is a highly talented football team, but you can't win solely on talent in the SEC... just ask Florida. The reigning SEC East champs aren't receiving much love from the media this offseason. The most generous prediction I've seen for Mizzou was a third place ranking in the east behind the Dawgs and Gamecocks. What gives? The newbies of the SEC return QB Maty Mauk who played in ten games last season for the Tigers, as well as RB Marcus Murphy who could prove to be one of the most versatile players in the nation this season. However, the biggest question mark comes at the wide receiver position with the graduations of Marcus Lucas and L'Damian Washington, as well as the dismissal of Dorial Green-Beckham a few months ago following a second marijuana charge on the former #1 recruit. Maty Mauk will have his work cut out for him with new targets to work with this season. The key to Hugh Freeze and the Rebels' success on offense stems from the arm of QB Bo Wallace and his play-making ability. The guy has plenty of options out wide for his choosing -- WR Laquon Treadwell and TE Evan Engram will lead the way for this year's receiving corps. Potential Losses: Boise State, Alabama, @Texas A&M, Tennessee, @LSU, Auburn, Mississippi St. It's kind of shocking to me that the media has been loving up on South Carolina as much as they have. Spurrier's crew lost a quarterback, Connor Shaw, and one of the most dominant defensive linemen of all time, Jadeveon Clowney, yet they're still considered to be an SEC East favorite alongside Georgia. I do however believe that Dylan Thompson will be a fine replacement to Shaw, possibly an even better one, and the senior quarterback will have plenty of options when it comes to receivers -- the lone receiver to graduate last year was Bruce Ellington. But in the SEC you don't win games with speedy playmakers, you instead win them with the big uglies at the line of scrimmage, and while the offensive line should be one of the strengths of this team, the defensive line has some major holes to fill after being gutted by the NFL this past season. Can this team win the east? Sure, but I don't think it will. Thankfully, they get Georgia at home this time around. For the last few years, Tennessee fans have expected disappointment, and rightfully so. Four coaches in six years is nothing to be bragging about. But the term I hear the most from Vols fans is "rebuilding year". Let's get this straight, to have a rebuilding year, you had to have had a foundation year with some form of success, otherwise it's just simply a "building year". Tennessee might be heading straight into the eye of the storm this season. Returning the least starters in the SEC (10) with not a single returning offensive lineman is quite ludicrous. But for some screwed up reason, Tennessee fans should have hope. Butch Jones came into a dumpster fire of a program, one that desperately needs a leader to take charge. Jones is that guy. Tennessee recruiting is booming again, unlike the Dooley days when even Vandy was out-recruiting the Big Orange. Suddenly, 5 stars are committing, fans are actually showing up, and there's a sudden sense of pride of being a Tennessee Vol. Will this season be an absolute roller coaster? Yes. Will the team surprise some people? Definitely. Once the offensive line settles into place, watch out. The Vols will once again be a serious SEC East contender very soon. Am I the only one that thinks this team will be completely dreadful? No defense, added with the fact that Johnny Football is no longer running circles around defenses equals a miserable season for Aggie fans. While the defense can only get better this season after a horrendous 2013 season, as DC Mark Snyder's unit ranked last or second to last in every major defensive category). The quarterback race is heating up with just a few weeks to go in fall camp, as 5-star freshman Kyle Allen is competing for the job against sophomore Kenny Hill. Whomever wins the job will have a tough road ahead to compensate for the amount of points allowed on the other side of the ball. Right now, I can't see the Aggies making a bowl game, as their SEC magic runs out. Even with only 11 returning starters, the biggest key loss to the Vanderbilt football program is former head coach, James Franklin. Franklin, in hopes of a more passionate fanbase, something he longed for while in Nashville, settled into his new office at the Penn State Athletic Complex back in January, leaving the Commodores to frantically search for a new head coach. Six days later, AD David Williams reached agreements with former Stanford DC Derek Mason. The defensive-minded Mason will be leading a team with just three returning starters on the defensive side of the ball -- a blow to an already wounded team. And with road games against Georgia, Missouri, and rising threat, Mississippi State, Vanderbilt's chances at a bowl game are pretty slim.